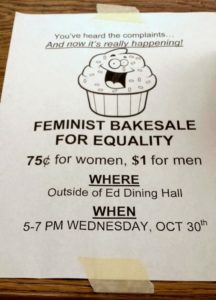 Do a Google image search for Feminist bake sale and find that American people working to achieve gender equality for women will sometime sell cupcakes – 1 dollar for men and 75 cents for women. The prices are designed to bring attention to the wage gap in America. But do these bake sales do more harm than good? What are the unintended consequences of gender-specific prices? Now, for those of you who can’t access the Flax (1987) article, I don’t want to mislead you. The author argues that “the fundamental purpose of feminist theory is to analyze how we think, or do not think, or avoid thinking about gender” but that theory alone is not enough. We also need feminist political action. These bake sales would qualify as action. The extent to which feminist political action needs to be informed by feminist theory is unclear. What I am asking you to do now is to apply feminist theory (or another framework if you prefer) to evaluate a feminist political action. Think about how a feminist bake sale might reflect or even influence our thoughts about gender. And please share your thoughts.